The St. Patrick’s Day Parade is an annual local town custom in Delray Beach that began in 1968 with a Irish local pub owner by the name of Maury Powers, who took a saunter down Atlantic Avenue with his Shillelagh and a green pig and alleged it “My own parade.” March 12th, 2016 from 11am-7pm join in the parade and festivities in Delray Beach! Since then, a group of Emergency Service personnel stepped in to add a civic motif to the parade that has had uniformed police officers, firefighters and EMS personnel from all across the United states and as far away as Belgium, Ireland, Australia, Canada, and France come to participate in Delray Beach’s St. Patrick’s Day Parade and represent their home towns and communities. 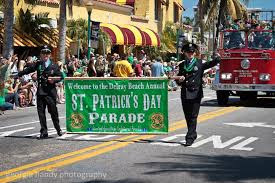 The residents of Delray Beach continue to support their St Patrick’s Day Parade in bringing a sense of community unity and presenting a positive role model image for children. The uniformed multi-national Emergency Service ambassadors, are blended in with commercial, civic, non profits, educational, and social groups. The event has evolved and grown over the years to become Florida’s premiere home town parade! The largest group of parade viewers will be downtown in the area of the railroad tracks between East 2nd and 3rd Ave’s. It is recommended that you stay away from this area and set yourself up for viewing the parade between Swinton Ave. and West 5th Ave. on Atlantic Ave. Ocean Ridge Estate For Sale! Key West Style Home In Juno Beach For Sale! North Bay Village Waterfront Home For Sale! Farm Estate On The Market In Fort Pierce! Artesia in Sunrise A New Community!